I think I picked up the affection for Schnitzel a couple summers ago when I was in Vienna, but I’ve wanted and made it a couple times lately, and this round came out reasonably photogenic. 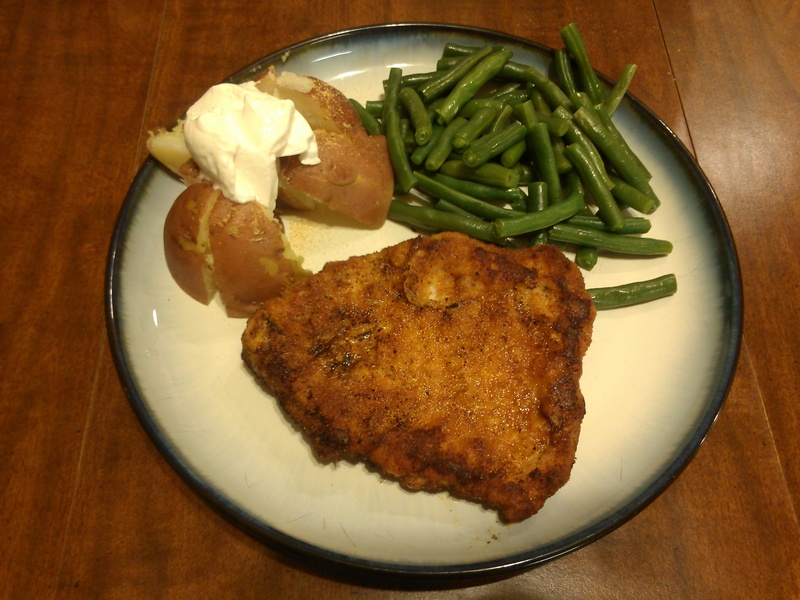 This is pretty classic Weiner Schnitzel style with pork, pounded out, dredged in flour with a bit of salt, pepper, and garlic powder, washed in beaten egg and milk, breaded in crumbs with paprika, and pan fried in oil with a pad of butter. There is nothing about this that is healthy, it makes a terrible mess of the kitchen, and I still haven’t quite perfected the process (too dark or a little bit of sogginess on the underside of the breading or…), but the pounding and the breading makes for excellent texture, and it is terribly satisfying. This entry was posted in FoodBlogging. Bookmark the permalink. Grace isn’t everything but sometimes it looks like it is.